California is the most populous states of the nation which is situated on the Western Coast of the United States. California is the 3rd largest state by area and is bordered in the north by Oregon, in the east by Nevada, Arizona to the southeast, and the Mexican state of Baja California to the south. California is officially nicknamed as the “Golden State”. The nickname was designated from discovery of gold and abundant fields of golden poppies visible each spring throughout the state. Sacramento is the capital city of California. The historical timeline of California is divided into five categories, namely the Native American period (pre-European), European exploration period (1542 to 1769), the Spanish colonial period (1769 to 1821), the Mexican period (1821 to 1848), and California statehood till present day. Before the European settlement, many different Native American tribes inhabited the area which is now the present day California. The tribes were hunters-gatherers, who followed gardening and fire-stick farming in the forests, wetlands, woodlands and grasslands, practiced fishing, basket weaving, and canoe building. California has the largest population of Native Americans and other distinct tribes in the United States. They spoke over 300 dialects of 100 distinct languages. European explorers came to California somewhere in the mid 16th century and explored the Pacific Coast of California. The west coast of present-day Mexico including the Gulf of California were explored by Francisco de Ulloa. The Portola expedition was regarded as the start of European exploration of the current California which led to Spanish colonization of Las California Province. Spanish missionaries started establishing California Missions on or near the coast of Alta, beginning in San Diego post the Portola expedition of 1769-70. Also, numerous forts and small towns were constructed by Spanish military forces. The Portuguese were the first to explore the coast of California. The Spanish colonization started sometime in the late 18th century. They explored the trading routes focusing on trading gold and silver from America and goods and spices from Asian areas and China. The trading system proved to be highly profitable to the Spanish which they continued for over 100 years. California was divided into two parts by the Spanish. The parts include Baja (lower) California comprising of the Baja Peninsula and terminated roughly at San Diego, California and Alta California, as provinces of New Spain (Mexico). Many missions were founded in Baja California and later in Alta California after the end of Seven Years War. The Spanish missions in Alta California were composed of series of religious and military outposts which were founded by Catholic priests of the Franciscan order to spread Christianity among the local Native Americans. The missions provided the Spanish first solid platforms to colonize the Pacific Coast portion, the extreme northern and western of Spain's conquer. The European settlement had also brought in ranching technology, farming and growing vegetables and fruits into the Alta California region. The Mexican ruled California (1821 to 1848) The Mexican War of Independence in 1821 ensured Mexico and California freedom from Spain and the Mexicans took control over Alta California. Monterey became the capital of the Mexican government in Alta California and also became the important port of entry for trading purposes. The no trade with foreign ships policy was abolished by the Mexican government and soon regular and frequent trading trips started. The Mexican government also took possession of the missionaries and secularized. The Mexican Californian followed cattle ranches, or ranchos religiously. In the early 19th century, trappers and settlers from the U.S. and Canada traveled and settled in Northern California. California became the 31st state of the United states on 9th September, 1850 . California was under military governance from 1847 to 1850. The military government was unsettling due to lack of proper set ups and training. Later Constitutional Convention and election of Representatives were initiated and implemented. The previous capitals of California prior to Sacramento include San Jose (1850–1851), Vallejo (1852–1853), and Benicia (1853–1854). In 1854, Sacramento was officially designated the capital of California . .
(1821) Mexico freedom from Spain. (1849) California Gold Rush began and also California came under the control of the United States with Treaty of Guadalupe. (1882) Congress passed the Chinese Exclusion Act, prohibited all Chinese immigration. (1992) California became first state to elect two women namely Barbara Boxer and Dianne Feinstein to U.S. Senate. (2011) New law enacted that allowed illegal immigrants to receive state aid for college. California is the 3rd largest state of the United States covering a total area of 158,706 square miles . The state is roughly divided into the Northern and Southern California and is bordered by Oregon to the north, in the east by Nevada, Arizona to the southeast, and the Mexican state of Baja California to the south. Experts divide California into eleven distinct provinces from north to south, including the Klamath Mountains, the Modoc Plateau, the Basin and Range, the Coast Ranges, the Central Valley, the Cascade Range, the Sierra Nevada, the Mojave Desert, the Peninsular Ranges, the Transverse Ranges, and the Colorado Desert. California is one of the most populous states and is geographically diverse. California is part of the Ne-arctic ecozone and also features some of the most endangered ecological communities. Almost all parts of California experience a Mediterranean climate of cool, rainy winters and dry summers. California is home to some exceptionally tall trees and also provides a great habitat for numerous flora and fauna. California is geographically diverse and also has varied topography. The state is roughly divided into Northern and Southern California. The main topographical features of California include mountain ranges, basins, plateaus, and deserts. The Northern California is formed by the 48 northernmost counties of the state. The region comprises of San Francisco Bay Area, including the cities of San Francisco, Oakland, and San Jose, including Mount Shasta, redwood forests, Lake Tahoe, and the northern half of the Central Valley. Along the coast, the climate varies from marine to warm Mediterranean climate, in the valley it is Continental Mediterranean climate and alpine climate zones in the high mountains. Northern California is least populated accept San Francisco bay area and Sacramento metropolitan area but it is in fact known for its high technology industries, such as software and semiconductor and also famous for clean power, biomedical, government, and finance. The Southern California is formed by the 10 southernmost counties of the state. The southern California comprises of San Diego, Los Angeles, Orange County, and Riverside-San Bernardino and trier respective metropolitan areas. Southern California is hugely populated and is one of the most urbanized areas in the state. It is also home to numerous industries including the film industry, entertainment industry, residential construction, military aerospace software, automotive, ports, finance, tourism, biomedical, and regional logistics industries. The California Central Valley which is regarded as the agriculture heartland of California lies in the middle of the state and is bordered by the coastal mountain ranges in the west, in the east by the Sierra Nevada, the Cascade Range in the north and the Tehachapi Mountains in the south. The Central California is a large fertile area that lies between the coastal mountain ranges and the Sierra Nevada. The Sacramento-San Joaquin River Delta divides the Central Valley into Sacramento Valley of the Sacramento River in the north and the San Joaquin Valley of the San Joaquin River in the south. Some of the notable mountain ranges of California include the Sierra Nevada mountain range, the Klamath Mountains, the Coastal Ranges, the Cascade Mountains, the Los Angeles Range and the San Diego Range. The Sierra Nevada, literally translated as snowy mountains in Spanish is located in the east and covers about 430 miles from north to south. The Sierra range consists of many mountains including Mount Whitney, the highest peak in the United States. Many valleys are formed by mountain streams in the western part of Sierra. The Klamath Mountains are located in the northwestern part of California and comprises of numerous small forests and canyons. The Coastal Mountains run from the Klamath Mountains in the north to Santa Barbara. The Coastal Mountains encompass various smaller mountains, including the Diablo and Santa Cruz Mountains and also include the Napa Valley, and Salinas Valleys. The Los Angeles Ranges are a group of small mountain ranges and lie between Santa Barbara and San Diego counties. It is also known as the Transverse Ranges as the ranges run east to west. 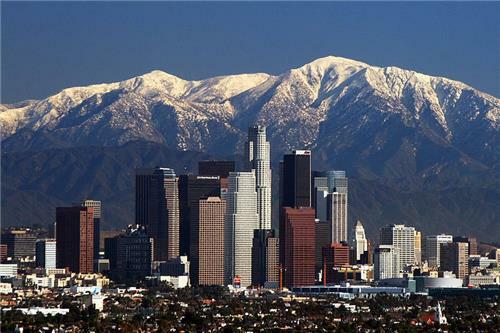 Los Angeles Ranges include the San Bernardino, Santa Ynez, San Gabriel, and Santa Monica mountains. The San Diego Ranges, also commonly known as the Peninsular Ranges lie in the southwestern part of California, mostly in the San Diego county. San Diego Ranges include the Laguna, Agua Tibia, and Vallecito mountains and runs into the Mexican peninsula. California is home to many national forests. The forest provides the natural habitat of many flora and fauna and also features some of the most endangered ecological communities. It features some of the world's most unique and rare trees, including the tallest (coast redwood), most massive (Giant Sequoia), and oldest (bristlecone pine). The major national forest of California are listed below. The Shasta-Trinity National Forest: It is the largest National Forest in California and comprises of 5 wilderness areas, many mountain lakes and over 6000 miles of streams and rivers. The Angeles National Forest: It is located in the Greater Los Angeles area. The Cleveland National Forest: It is the southern-most National Forest in California. The Eldorado National Forest: It is located in the central Sierra Nevada of California. The Inyo National Forest: It encompasses Mono Lake, Mammoth Lakes Basin, Mt. Whitney, and the Ancient Bristlecone Pine Forest, with 7 designated Wilderness areas. The Klamath National Forest: It lies along the border of California and Oregon and it is one of most bio diversified forests in America. Lake Tahoe Basin National Forest: It is located in the Sierra Nevada mountains. The Lassen National Forest: It lies at the Crossroads where the granite of the Sierra Nevada, the Modoc Plateau, the lava of the Cascades and the sagebrush of the Great Basin merge. Los Padres National Forest: It is located in San Francisco and extends from north to south. The Mendocino National Forest: It lies within the eastern spur of the Coastal Mountain Range in north of San Francisco and Sacramento. The Modoc National Forest: It lies in the extreme northeastern corner of California and a great vacation destination. The Plumas National Forest: It is a versatile forest with pleasant climate that is located in the Sierra Nevada, south of the Cascade Range. The San Bernardino National Forest: It varies from desert floor to alpine peaks, and also include flowering cactus. The Southeastern deserts of California are located in the Basin and Range Province. The region extends through Nevada, Oregon, and other states. The Northern portion of the Basin and Range Province consists of mainly lava plateau. The southern part consists of deserts, including the Mojave Desert and the Colorado Desert. The topography of the Mojave desert consists of typical mountain-and-basin landscape with arid climate and bare vegetation. It is located between the Great Basin Desert to the north and the Sonoran to the south. The region is rich in borax, potash and salt and also found deposits of silver, tungsten, gold and iron. The Mojave Desert is home to some indigenous plant species of Big Sagebrush, Cactus, Desert Spanish Bayonet, Bladder-sage, Shadscale, Mojave Yucca, bursages, Creosote Bush, and Blackbush. The Colorado and Sonoran Deserts lie to the east of the peninsular ranges lie. The desert encompasses Salton sea. The Colorado desert serves as an important habitat of some unique and rare flora. The temperature in this region is higher summer daytime temperatures than higher-elevation deserts and frost is almost nil and receives rainfall in two seasons per year. Rivers in California also form the major topography of the state. The two main rivers that divide the central valley into the northern and the southern portion are the the Sacramento River and the San Joaquin River. These rivers drain the Central Valley and the west slope of the Sierra Nevada and flow through San Francisco Bay to join the Pacific Ocean. Some of their main tributaries are the Tuolumne River, the Pit River, and the Feather River. The largest river in California is the Eel River that is not dammed and is left in its natural undisturbed state. The other important Rivers of California are the Mojave River, the Trinity River, the Klamath River,the Colorado River, Smith River, Navarro River, and Garcia River. The two massive projects that manages the majority of the Rivers of California which are dammed are the Central Valley Project that is successfully supplying water to the agricultural central valley, and the California State Water Project that is taking a huge task in redirecting water from northern to southern California. California's climate is varied and ranges from Mediterranean to subarctic. Mediterranean climate with rainy winters and dry summers is prevalent over the Coastal and Southern parts of the state. Summer fogs are also prevalent in the coastal areas. Northwestern California experiences temperate climate and the southeastern regions have a hot arid climate, similar to desert climate. Death Valley in the Mojave Desert is the hottest region in the world. Places such as the Coachella Valley, east Los Angeles, Gateway cities, parts of San Gabriel Valley region, and Santa Monica experience warmer winters. Northern parts of the state receive more annual rainfall than the southern parts. West-facing mountain slopes are some of the rainiest parts of the state. . Alpine climate with snow in winter and mild to moderate summer temperature is prevalent over the high mountains, including the Sierra Nevada region. The highest temperature recorded in the world was134oF (57oC) in the Death Valley on July 10, 1913 . The all time lowest temperature recorded in California was −45oF (−43oC) in 1937 in Boca . California is the most populous state of the United States. California had an estimated population of 38,332,521 as of 2013, which marked an increase of 2.9% since the year 2010. The population density of the state is 239 people per square mile . Some of the most populated cities of California are Los Angeles, San Jose, San Diego, Sacramento, San Francisco, Fresno,Long Beach, and Oakland. The major languages spoken in Arizona are English, Multilingual, Spanish, Chinese, Tagalog and Vietnamese. The religion followed in California include Christianity, Protestant, Jewish, and Muslim. California has largest number of Roman Catholics, followed by Mormon population. It is one of the fastest-growing and adopted groups in the state. Asian immigrants brought in and introduced Hinduism, Buddhism, Shintō, Sikhism, and Taoism. According to U.S Census estimation, California also has the largest Muslim community in the United States. In 2013, the Census Bureau reported California's's population as 73.5% White alone, 6.6% black or African American, 38.4% Hispanic or Latino, 14.1% Asian, 1.7% American Indian and Alaska Native, and 39.0% non-Hispanic or non-Latino white. As of 2010 U.S Census estimation, California has the largest population of Native American consisting of the most Native American tribes, indigenous to the state or not, and Latin American Indian. The Cherokee Tribe is the largest tribe in the state. Los Angeles/Long Beach, San Francisco/Oakland, Sacramento, and San Diego areas are home to large communities of Urban American Indians. The other important tribes includes Apache, Choctaw, Creek, Hopi, Zuni, Navajo, Blackfeet, Shoshone, Paiute, Pueblos, Cahuilla and Chumash tribes. California has the most powerful and largest economy in the United States and also one of the largest economies in the world. As of 2013 estimation, the gross state product was $2.050  trillion and income per capita was $47,401 . The major sectors of employment in California include trade, transportation, and utilities, government, professional and business services, education and health services, and leisure and hospitality. Trade is the main focus for California’s economy. California has the highest rate of poverty in the country. Agriculture is main sector and plays a major role in California's economy. The three largest agricultural products of California by value include milk and cream, shelled almonds, and grapes as of 2011 United States Department of Agriculture’s estimation. California is ranked among the top in United States in agriculture. Agriculture is one of the main domains which play a vital role in the growth of the state’s economy. California’s success in agriculture lies on its fertile soil, moderate Mediterranean climate, a lengthy growing season, availability of many farming lands, the use of modern agricultural methods and technologies and extensive irrigation The California Department of Food and Agriculture (CDFA) oversees the entire agricultural activities and produces of the state of California. California is the surplus producer of fruits, vegetables, wines, dairy products and nuts, including, grapes, cotton, flowers, lemons, artichokes, avocados, squash and oranges. Additionally, dairy products including milk and cream generate huge income for many and California is the leading producer of milk in the United States. Artichokes, olives, clingstone peaches, figs, almonds, ladino clover seed, kiwifruit, dried plums, dates, raisins, pistachios, pomegranates, sweet rice,and walnuts are commercial produces only in California and are great export items that generate huge revenues. Livestock and poultry also contribute immensely to California’s income. Poultry is largely accepted in California and large quantities of eggs are produced each year. There are numerous bee colonies across the state and are included under livestock. Bees are important aspects which are used both for pollination and production of honey. California boasts of one of the leading industrial states in the United States. California is in the top in manufacturing domain and is also doing exceptionally well in other sectors including machinery, fabricated metals, food processing, electronic and other electrical equipment, transportation equipment, apparel, industrial machinery, computers, aerospace technology, film industry, entertainment industry and many more. Major industries in California are mainly located in the two major manufacturing hubs of Los Angeles (Long Beach–Orange County area) and San Francisco (Oakland–San Jose area). California’s main manufacturing products are Computers and aerospace and these sectors generate huge revenue for the state. California's film and entertainment industry (HOLLYWOOD), based primarily in Los Angeles, has been the pride of the state and generated an annual payroll of billions and is also one of the major employers of the state. California is a successful state in setting up many more motion picture industries due to its cheap land, pleasant and good all year-round climate and large natural spaces and resources. Souther Califronia is a home to many film industries. Tourism is also a principal part of California’s economy and is one of the largest employers of the state. Many plans and programs are implemented to improve California’s transportation network and accordingly enhance the tourism sector. Some of the major tourist attractions of the state include Tunnel View - Yosemite National Park, Golden Gate Bridge, Lake Tahoe, Big Sur Coastline, Disneyland, Dante's View - Death Valley, Venice Beach, Redwood National Park, SeaWorld San Diego, General Sherman. California has two major nuclear power plants, namely Diablo Canyon and San Onofre. Crude oil and natural gas deposits of California are found in the Central Valley and along the coast of the large Midway-Sunset Oil Field. The state’s main electricity provider is Natural gas-fired power plants. Cities including Oakland, Berkeley and Davis have announced and accepted themselves as nuclear-free zones. The education system in California comprises of the public and private schools, public and private universities, colleges and high schools. The California Department of Education is the division which is responsible to assess and manage the workings of all schools, colleges and universities in the state. The department’s mission is to provide world class education and best values to the students to ensure success in education, workplace and in every spheres of life. Tom Torlakson is the current State Superintendent of Public Instruction. Various programs and plans are implemented to enhance the standard of education and also to improve the academic success rate. Some of the initiatives and programs include Bullying and Hate Motivated Behavior Prevention, Civic Education Initiative, Core Reforms Engaging Arts to Educate (CREATE), Family Engagement Framework, International Visitors and Official Delegations, School Financial Emergency, Schools of the Future Initiative and United States Senate Youth Program. California takes pride in presenting one of the renowned research universities in the nation, the University of California (UC). The major campuses of UC are situated in Berkeley, Los Angeles, San Diego, Davis, Irvine, Santa Cruz, Riverside, Santa Barbara, Merced and San Francisco. The University of California directly manages and administers Lawrence Berkeley National Laboratory, the United States Department of Energy. California State University (CSU) system has its many campuses located across California, including Long Beach State, Cal Poly, Cal State San Bernardino, Cal Poly Pomona, Cal State Fullerton, San Francisco State, Fresno State, Sacramento State, San Diego State, and San Jose State. CSU is the largest university system in the nation. The California Community Colleges system provides many lower general courses and the students can avail the benefits of transferring their credit units are transferable to the CSU and UC systems, as well as vocational education, remedial education, and continuing education programs. California makes an effort to incorporate sports in every individual’s life and also include more sports and sports programs in schools, colleges and universities. California is proud to present its nineteen major professional sports league franchises, which is the highest in the nation. The major sports loved and played in California are American football, Baseball, Basketball, Ice hockey, and Soccer. The main leagues of California include National Football League, United Football League, Major League Baseball, Arena Football League, National Basketball Association, Women's National Basketball Association, National Hockey League, Major League Soccer, and Professional Arena Soccer League. As California has many notable universities in the United states, collegiate sports programs are hugely followed and respected by many. Apart from the top academic achievements, the athletic programs of some universities , including University of Southern California, University of California, Berkeley, UCLA, Stanford University are nationally ranked. Local sports including motorsports and auto racing are also one of the favorite recreational sports of the locals as well as the tourists. Racing events are annually hosted in the city of Long Beach. Some of the main racing events are Indy Car Series, American Le Mans Series , Auto Club Speedway, the NHRA Drag Racing Series, the NASCAR Sprint Cup Series, The NHRA Drag Racing Series and the AMA Supercross Series. Hospitals in California are well equipped with technologically advanced facilities, efficiently manned and provide 24-hour inpatient care, including medical, nursing, surgical, anesthesia, laboratory, radiology, pharmacy services, child care, maternity care, mental well being, and many more services. Almost all the hospitals in California make an effort to follow environmentally preferable practices. The Government of California is guarded by the Constitution of California. California became a 31st state of the United States on Sept. 9, 1850. The government of California is divided into three distinct branches: the executive branch (Governor of California, Constitutionally elected officers and state agencies), the legislative branch (the House of Representatives and the Senate) and the judicial branch (Supreme Court and lower courts). The Executive branch of California consists of the Governor of California and the constitutionally elected Officials. Democrat, Edmund G. Brown Jr. is the current governor of California who was sworn in for a record fourth term on January 5, 2015. California State Legislature is the body of the state government of California which is divided into two separate assemblies, namely California State Assembly and California Senate. The California Department of Transportation is commonly termed as Caltrans. The department overviews the entire transportation network of the state of California. California’s vast terrain and varied topography are connected by a comprehensive transportation system. Caltrans administers and manages the state’s highways, freeways, railways, airports, hospital heliports. The transportation system in California comprises of the roadways, airways, railways and the waterways. I-5, I-8, I-10, I-15, I-40, I-80, I-105, I-110,I-205,I-210,I-215,I-280,I-380, I-405, I-505, I-580, I-605, I-680, I-710, I-780, I-805, I-880 and I-980. Additionally, the United States highways in California include US-6, US-50, US-95, US-97, US-101, US-199 and US-395. Air transportation is an essential gateway of California that serves the locals and tourists from all over the world. The primary airports of California include Los Angeles International Airport, San Francisco International Airport, San Diego International Airport, Sacramento International Airport and many more. The railways is also one of the main transportation modes in California that serves people from all walks of life and also important for cargo transfer. The main intercity rail service is provided by Amtrak California. The Interstate Amtrak lines include the Coast Starlight, the Texas Eagle, and the Sunset Limited. The combination of blue and gold is designated as official colors in California. The American folk dance is called Square Dancing and encompasses squares, rounds, clogging, contra, line and heritage dances. It is a valued dance and art form genuinely originated in California. The official state mineral is gold. The official California State Silver Rush Ghost town is Calico, in San Bernardino county. The California State Railroad Museum is the largest railroad museum in North America. Death Valley is one of the hottest and driest places in the world. California is also commonly known as The Land of Milk and Honey, , The Golden State, The El Dorado State and The Grape State. California grows tonnes of grapes annually and consequently produces million gallons of wine each year. Mount Whitney in Califronia is the highest peak in the contiguous 48 states of the country. California Gray Whale is Californis'a state marine mammal. Eureka (I Have Found It) is the official state motto. Benitoite is the official state gemstone.